I got a note today from a woman thanking me (like, five times) for signing a book for her husband. She wanted me to know how much it meant to him to have my good wishes and signature on his 35th birthday. I don't know if most people realize what a joy it is to be asked to sign a book. That little bit of ink confirms the transcendence the written word. It acknowledges the bond between writer and reader, the connection of separate generations and complete strangers, the writer's effort and the almost unbelievable power of literacy. So if you ever want a book signed, I would LOVE to. I will feel honored and I always have 6-10 fine tip sharpies in the back pack. We almost never get writers to do signings here in the Philippines. I remember how excited I was when Neil Gaiman came over last year. Lined up for about 4 hours just to get two books signed. I don't regret any bit of it. I can't wait to sign my first book! Thanks for sharing this - and what a fantastic photo! I guess that is something a bit sad about everyone going to eReaders - where to sign? I KNOW. You will love it and we will all really miss signing if it becomes obsolete. Maybe that will be one of the values of paper books that can't be recreated on a device. At SF and Fantasy cons, there are always a few people who have me sign eight or ten books--because they are collectors and hope the books will be worth something down the line. Maybe, if signed books are are more rare, they will be more sought after? Sigh. 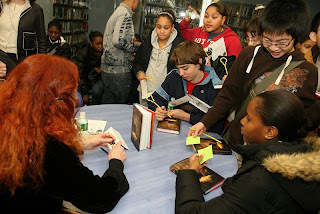 I love signing book for KIDS.